The Smyth lobby, designed by famed Yabu Pushelberg, features modern interiors with a classic twist, drawing inspiration from the vibrant surrounding neighborhood. The space resonates with a romantic notion of an elegance of years gone by and the ambience reflects the fine balance of wit and refinement of a gentleman. The materiality speaks to that of a fine, tailored bespoke suit; pairing sumptuousness fabrics with a curated collection of custom and vintage furniture. A sense of craftsmanship can be seen in each and every vignette; creating an eclectic sculpted lobby for all guests to enjoy. 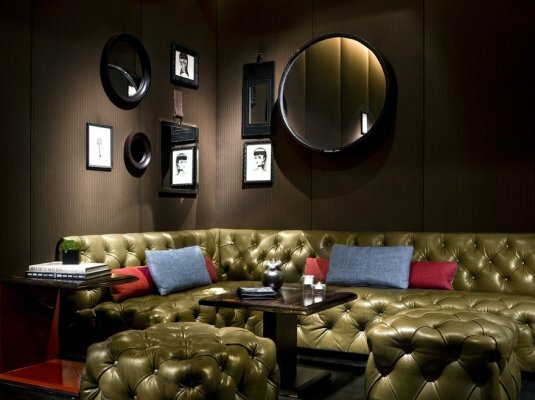 The lobby is a call-back to a London gentlemen’s club; featuring a lobby bar surrounded by a luxe seating area of vintage and modern furniture. 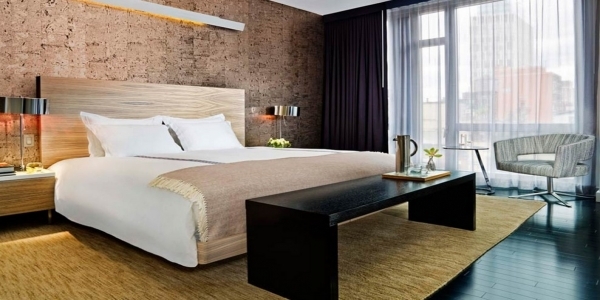 The 100 contemporary, loft-style guestrooms, presented in a vintage wine tone, are outfitted with rich walnut paneling and furniture accompanied by chrome accents. The full marble bathroom is complete with opulent Hans Grohe figures; lavishly designed with rain showerheads, luxurious fixtures, a centerpiece floating sink and features a floor-to-ceiling translucent glass shower wall that discreetly separates it from the bedroom. Plein Sud,Smyth Bar, Toro Lounge and Smyth’s top-tier suites and penthouse are available for private events, parties, and meetings. Frederick Lesort’s latest concept in a series of French-inspired restaurants, Plein Sud Restaurant & Bar a Vins brings affordable and authentic Brasserie-style cuisine to TriBeCa. The market-fresh and seasonal menu features an array of dishes influenced by the rich and diverse gastronomic heritage of France with a nod to its southern regions. For weekday breakfast, the kitchen delivers a variety of riffs on Eggs Benedict, such as Plein Sud Eggs Norwegian in addition to a bevy of griddled items, granolas, pastries and fruit. Plein Sud’s dinner menu includes a choice of hors d’oeuvres such as Poisson Cru, homemade Pates et Terrines served with toasted brioche and seasonal preserves, as well as artisanal flatbreads baked in the restaurant’s brick oven. Sandwiches and tartines include the Le Burger Royale aux Fromage, an 8-ounce Pat LaFrieda Black Angus burger stuffed with cheese and black truffle aioli and served on a toasted brioche bun with parmesan and herb tossed potato fries. For heartier fare at this French restaurant in TriBeCa, entrees such as Steak au Poivre, grilled 14-ounce pepper-crusted New York strip, and Poulet Roti Forestiere, rosemary mushroom stuffed chicken, are available at this authentic TriBeCa brasserie in addition to house specialties such as Duo of Escargot Persillade, sautéed escargot, and nightly specials such as Bouillabaisse, served on Fridays. Plein Sud’s weekend brunch includes Brioche French Toast with sautéed bananas and maple syrup; Croque Monsieur, grilled ham and cheese with Mornay sauce; and Grilled Chicken Paillard, spicy arugula and shaved crudités. Located adjacent to the hotel lobby, Smyth Bar is an eclectically sculpted bar in TriBeCa. Adorned with sumptuous fabrics and a mix of Brazilian modernist furniture and vintage pieces, Smyth stands out among Downtown NYC bars as a comfortable and intimate destination. Toro Lounge, Smyth’s lower-level cellar cocktail lounge offers a luxurious hideaway for guests and locals alike. This intimate TriBeCa cocktail bar is the ideal place to unwind away from the bustle of the city outside.